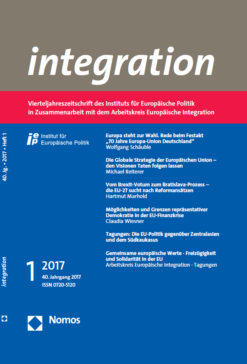 In the new issue of integration, Minister Wolfgang Schäuble presents prospects for the future of the European Union and details his proposals for deeper integration. Michael Reiterer discusses key concepts of the new EU Global Strategy and gives an outlook on implementation. Harmut Marhold’s article offers an analysis of recent reform proposals for the EU after Brexit as published by the remaining 27 member states, EU institutions and civil society organisations. Claudia Wiesner focuses on theoretical and practical perspectives of representative democracy in the EU multilevel system against the backdrop of governance mechanisms that have been developed in the EU’s current financial crisis. Besides the report on the first international conference of the PhD Support Programme ‘The EU, Central Asia and the Caucasus in the International System’, that concentrated on the EU’s policy towards Central Asia and the Southern Caucasus caught between regional and bilateral approaches, the ‘Arbeitskreis Europäische Integration’ reports on conferences about common European values and the limits of free movement and solidarity within the EU. Federal Minister of Finance Wolfgang Schäuble presented prospects for the future of European integration on the occasion of the 70th jubilee of the “Europa-Union Deutschland”, Germany’s largest pro-European citizens’ initiative. Starting with the paradoxical observation that rising support for Europesceptics coincides with increasing demand for European political solutions, he underlines that national policies alone cannot cope with current global and societal challenges. Since a treaty revision does not have the necessary support, he advocates an intergovernmental approach to achieve reforms. For defence, economic, labour market, asylum and migration policy as well as for the monetary union he then details his proposals for deeper integration. In the past, crises have strengthened Europe. With regard to the size of the current crises, we Europeans face huge opportunities which we should grasp. The strategic environment of the EU has changed dramatically over the past years. In response to the new challenges, the High Representative of the Union for Foreign and Security Policy has published a new Global Strategy which sets out the EU’s core interests, priorities and principles for engaging in the world. In order to translate this “shared vision” into action, a follow-up process is under way. With a focus on putting the strategy into action, the article discusses some of its key concepts such as resilience, the security and defence nexus as well as the security and development nexus. Furthermore, it highlights the need to renew the EU’s regional policies towards the European neighbourhood, the Middle East and Northern Africa, the Asia Pacific region, the Americas and Africa. It concludes that the strategy’s leitmotif of “principled pragmatism” means not to export the EU model, but supporting good governance through differentiated, tailor-made approaches and fostering multilateralism thereby contributing to global governance. Tangible results are necessary to win over the hearts and minds of citizens. The British decision to leave the European Union resulted in two debates on the future of the EU: First, the Union has to reach an agreement with the United Kingdom on how to organise Brexit. Second, the EU institutions and the remaining 27 member states have to think about how to reform the EU political system. The article reviews the latter debate and analyses recent proposals for reforming the EU published by member state governments, EU institutions and civil society organisations since the British referendum in June 2016. Based on the review, the article compares the current reform debate to previous ones in the history of European integration and presents an outlook on its future course. The article discusses possibilities and limits of representative democracy in the EU multilevel system against the background of governance mechanisms that have been developed in the EU’s current financial crisis. The core argument is that these new governance mechanisms crucially intensify existing democratic deficits in the EU multilevel system. In the article, first the main arguments of the democratic deficit debate are summarised. After that, the governance mechanisms established during the financial crisis are discussed with regard to their effects on representative democracy in the multilevel system. Finally, possibilities and limits of representative democracy in the EU financial crisis will be discussed from a theoretical and a practical perspective. Die Grenzen von Freizügigkeit und Solidarität in der EU – Unionsbürgerschaft, quo vadis? Preise 2017: Jahresabonnement Privat (Printausgabe inkl. Onlinezugang) 78,– €; Jahresabonnement für Studierende (Printausgabe inkl. Onlinezugang) 44,– € (bitte Studienbescheinigung zusenden); Jahresabonnement für Institutionen (Printausgabe inkl. Onlinezugang) 124,– €; Einzelheft 22,– €. Alle Preise verstehen sich inkl. MwSt. zzgl. Vertriebskosten (Vertriebskostenanteil 10,81 €, plus Direktbeorderungsgebühr Inland 1,61 € p.a. ).